Under the slogan “Innovation for Better Life”, Israel will highlight innovation in its pavilion at Expo 2010 Shanghai along with traditional Jewish culture. This is the first time that Israel is building a national pavilion at a World Expo. The design of its pavilion resembles two clasped hands, symbolizing Israeli innovation and technology. The impressive design for the Israeli pavilion has been nicknamed the “Sea Shell” (in Chinese “Hai Bei Ke”) which goes along with the mascot of the Shanghai Expo, Haibao, and Shanghai as a coastal city. The pavilion, designed by the Israeli architect Haim Dotan, consists of three areas: the Whispering Garden, the Hall of Light, and the Hall of Innovations. The Hall of light is covered with transparent PVC/glass, symbolizing technology, transparency, lightness and the future. The Hall contains a 15-metre screen that will show films highlighting Israel’s technological achievements. 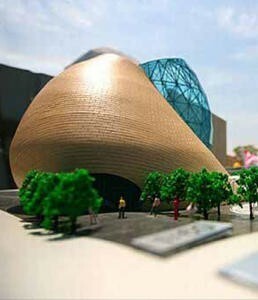 The Hall of Innovation is the centerpiece of the pavilion. and it’s covered in natural stone, symbolizing the connection to earth, history and the recycling of natural materials. A special audio-visual show will allow visitors to talk with Israeli children, scientists, doctors and inventors via hundreds of screens. These Israelis will introduce themselves and share their hopes for a better future.